General Atomics veröffentlichte im November 2017 einen Artikel, der die Leistung seiner ITER-Testanlage beschreibt und Lieferanten qualifiziert. Dieser Artikel zeigt, dass Linde Kryotechnik bereits zum zweiten Mal erfolgreich eine Kälteanlage für das ITER-Projekt entworfen, produziert, installiert und in Betrieb genommen hat. The cryosystem provides a thermal environment for stable operation of the feeder and CSM during final test. It must cool and warm the 120-t cold mass of the CSM and its support structure in a controlled manner to prevent large thermal stresses. The cool down rate from 300 K to 80 K is limited to ≤1 K per hour, and the maximum temperature difference between the CSM inlet and outlet is limited to 50 K. Below 80 K, there is no thermal stress limitation so cooldown is limited only by the refrigeration capacity of the cryosystem. The calculated cooldown time of the cryosystem and CSM is ∼14 days. 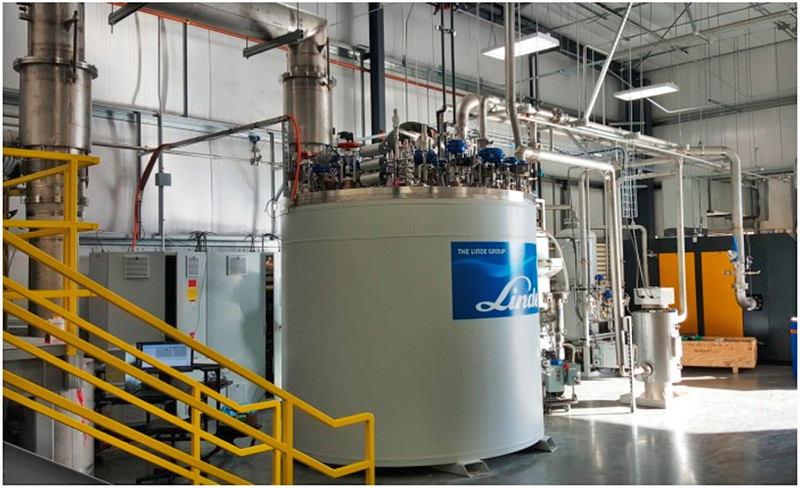 During steady state operation, the cryosystem provides 4.5 K supercritical helium to the CSM at a flow rate of 320 g/s and a pressure of 0.55 MPa. This flow rate corresponds to the ITER operational flow rate of 8 g/s per CSM layer. The calculated heat loads to 4.5 K include 92 W from the test chamber, 70 W from the Feeder and a 100 W allocation for electrical joint losses. In addition, the cryosystem provides 50 K helium gas to cool the HTSCLs and liquid nitrogen to cool the CSM and feeder thermal shields and cold mass support structures. The cryosystem coldbox and compressor installation is shown Fig. 5. The system was designed and manufactured by Linde Cryogenics. The design combines a standard refrigerator and supercritical helium recirculator in one coldbox. The refrigerator uses liquid nitrogen precooling and two turbine expanders to produce and maintain liquid helium in an internal 380l subcooler/heatexchanger, which operates at 4.3 K and 1.10 bara. The recirculator produces 350 g/s of supercritical helium flow at a pressure of0.55 MPa to the feeder in a secondary cooling loop. The helium in the recirculator loop is re-cooled to 4.5 K as it passes through the subcooler/heat exchanger. Liquid nitrogen is supplied from a 23,000 l tank which is batch filled. Helium inventory is managed using two gas buffer tanks with a combined volume of 225 m3. The buffer tanks operate between a pressure of 0.15 MPa and 1.4 MPa depending the system condition.